Although Dr. Mahathir Mohamad's earlier government (1981–2003) limited the powers and privileges of Malaysia's nine hereditary rulers, the political influence that they could exercise was still evident in the "Perak Crisis" of 2009, which also generated public debate about royal rights. In recent years, public wariness in Malaysia about politicians has helped the rulers present themselves as alternative sources of authority. "Monarchical activism" has been especially evident in the state of Perak, dating from 1984 when Sultan Azlan Muhibbuddin Shah, who was until then Malaysia's Lord President, was installed as the thirty-fourth ruler. In 2014, he was succeeded by his eldest son, Sultan Nazrin Muizzuddin Shah. Sultan Nazrin Shah has presented himself as a modern, educated and approachable ruler who consistently endorses the rule of law and is aware that public support for the monarch is highly dependent on meeting expectations in regard to ethical conduct and good governance. This paper argues that although Sultan Azlan Shah and Sultan Nazrin Shah have embraced the idea of a "new" Malaysian monarchy that actively responds to changing political and social contexts, two issues with especial relevance to the situation today can be tracked through the history of Perak's royal line since its inception in the sixteenth century. The first, arguably now of lesser importance, concerns royal succession. The second issue, still highly important, involves the ruler's relationships with non-royal officials and with elected representatives and the public at large. • Although Dr Mahathir Mohamad's earlier government (1981–2003) limited the powers and privileges of Malaysia's nine hereditary rulers, the political influence that they could exercise was still evident in the “Perak Crisis” of 2009, which also generated public debate about royal rights. • In recent years, public wariness in Malaysia about politicians has helped the rulers present themselves as alternative sources of authority. “Monarchical activism” has been especially evident in the state of Perak, dating from 1984 when Sultan Azlan Muhibbuddin Shah, who was until then Malaysia's Lord President, was installed as the thirty-fourth ruler. In 2014, he was succeeded by his eldest son, Sultan Nazrin Muizzuddin Shah. • Sultan Nazrin Shah has presented himself as a modern, educated and approachable ruler who consistently endorses the rule of law and is aware that public support for the monarch is highly dependent on meeting expectations in regard to ethical conduct and good governance. • This paper argues that although Sultan Azlan Shah and Sultan Nazrin Shah have embraced the idea of a “new” Malaysian monarchy that actively responds to changing political and social contexts, two issues with especial relevance to the situation today can be tracked through the history of Perak's royal line since its inception in the sixteenth century. The first, arguably now of lesser importance, concerns royal succession. The second issue, still highly important, involves the ruler's relationships with non-royal officials and with elected representatives and the public at large. It is difficult for students of contemporary Malaysia to write dispassionately about the institution of monarchy in a country where the Malay rulers have been protected from criticism, where they have been so embedded in Malay culture, and where they are perceived as guardians of Malay rights and of the Islamic faith. Yet in a world in which royalty is increasingly seen as anachronistic, Malaysia's nine sultans occupy a special place. Not only do they constitute almost a quarter of the world's monarchies, they continue to exercise considerable influence in Malaysia's political life. More particularly, over the last two decades a growing public disenchantment with the dishonesty and self-interest of politicians has led many Malaysians to look to the sultans as an alternative source of leadership. To a considerable degree this has been encouraged by the rulers themselves, alienated by the limitations on royal privileges imposed during the earlier regime of the current Prime Minister Mahathir Mohamad and by the depth of corruption in the government of Najib Razak as revealed by the 1MDB scandal. In October 2015, after the domestic inquiry was halted by Najib's dismissal of the attorney general, the Conference of Rulers issued a joint statement calling for a revival of the investigation and “stern action” against those incriminated. Two years later, the government's unabashed politicization of Islam prompted another royal warning about the deepening of racial and religious divides.3 On the other hand, it has sometimes been difficult for individual rulers to take the moral high ground; in Pahang, Najib's home state, 1MDB disclosures indicate that the sultan received large sums of money taken directly from development funds. The elections of May 2018 (GE14) brought a new coalition government to power under the banner of Pakatan Harapan, currently led by Dr Mahathir Mohamad, the erstwhile nemesis of the sultans. It is not yet clear whether Pakatan Harapan leaders will be able to set aside a baggage of resentment towards royal privilege and form a solid working relationship with the sultans at both state and national levels. Mahathir's supporters claim that he is a changed man, while the sultans, energized by what one observer has called “monarchical activism” are in a far stronger position than they were in the 1980s and 1990s. Until the shocking results in the 14th General Elections (GE-14) in 2018 that saw the long-ruling Barisan Nasional (BN) being defeated by the opposition coalition, Pakatan Harapan (PH) in parliament and in most states, Johor was always regarded as BN's electoral bastion. Johor has the highest number of parliamentary seats contested and historically won by the two largest BN parties, the ethnic Malay-Muslim-based United Malays National Organization (UMNO) and its Chinese partner, the Malaysian Chinese Association (MCA). With a mixed racial make-up (60 per cent Bumiputera, 33 per cent Chinese, and 7 per cent Indian), clear urban–rural divides, an influential royal house, and a growing and relatively industrialized economy (Hutchinson 2018, p. 2; van Grunsven and Hutchinson 2016), Johor is often deemed to be the bell-wether of BN's support, or rather, its “jewel in the political crown”. UMNO's strength in and dependence on Johor as its point of origin, a forging ground for leaders, and base of support has been convincingly documented (Hutchinson 2015b; 2018; Funston 1980). Yet, the same cannot be said for the MCA. The party's relative resilience in Johor, albeit amidst a notable decline from 2008 to 2018, remains unexplored. Its resilience can be seen from the fact that Johor MCA managed to hold onto most of its seats in the 2008 elections despite BN as a whole suffering massive losses nationwide. The importance of Johor can also be intimated from the fact that most MCA presidents are in some way connected to Johor — some for the fact that they are Johor-born (Neo Yee Pan, Chua Soi Lek); some for standing for office in the state (Lee San Choon and Ling Liong Sik); and almost all, with the exception of Tan Siew Sin, Tan Koon Swan, and Liow Tiong Lai, for having at some point of time been appointed Chairman of the MCA Johor State Liaison Committee. 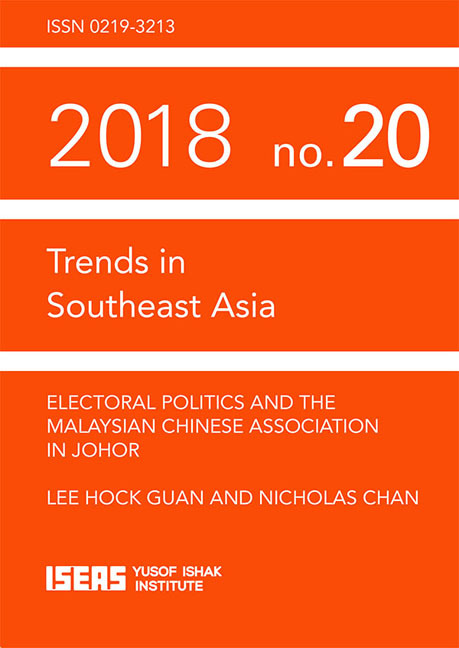 This paper examines the MCA's electoral performance in Johor in relation to its history, Malaysia's national politics in general, the state's changing socioeconomic landscape, and most importantly, the unique ethnic-pooling formula that ultimately worked in the MCA's favour. • Like the United Malays National Organization (UMNO), the Malaysian Chinese Association (MCA) was known for having its bastion in Johor, with the state containing the highest number of parliamentary seats contested and won by the party. • Two features of the MCA stand out: (1) its relative resilience in that its near elimination in other states since 2008 did not occur in Johor until the recent 14th General Elections, and (2) that most MCA presidents had some connections to Johor, either as having been born in Johor, contested in a Johor constituency, been chairman of the Johor state liaison committee, or a combination of three. • Although historical institutional linkages such as the New Villages and the Chinese guilds and associations (CGAs) gave the MCA a strong footing in Johor initially, changing political and socioeconomic circumstances gradually eroded the party's support among the Johorean Chinese. • As it began to lose appeal as an individual party, the MCA Johor had to depend on a strategy of mixed voter pooling so that the significant loss of support from the Chinese could be compensated for by the Malay electorate that was until recently highly supportive of the Barisan Nasional (BN). • The strategic dependence of the MCA on the UMNO was rendered void when the latter was defeated in the state. As it stands, the revival of the party's standing both within Johor and nationally is far from certain. Like the United Malays National Organization (UMNO), the Malaysian Chinese Association (MCA) was known for having its bastion in Johor, with the state containing the highest number of parliamentary seats contested and won by the party. Two features of the MCA stand out: (1) its relative resilience in that its near elimination in other states since 2008 did not occur in Johor until the recent 14th General Elections, and (2) that most MCA presidents had some connections to Johor, either as having been born in Johor, contested in a Johor constituency, been chairman of the Johor state liaison committee, or a combination of three. Although historical institutional linkages such as the New Villages and the Chinese guilds and associations (CGAs) gave the MCA a strong footing in Johor initially, changing political and socioeconomic circumstances gradually eroded the part's support among the Johorean Chinese. As it began to lose appeal as an individual party, the MCA Johor had to depend on a strategy of mixed voter pooling so that the significant loss of support from the Chinese could be compensated for by the Malay electorate that was until recently highly supportive of the Barisan Nasional (BN). The strategic dependence of the MCA on the UMNO was rendered void when the latter was defeated in the state. As it stands, the revival of the part's standing both within Johor and nationally is far from certain. 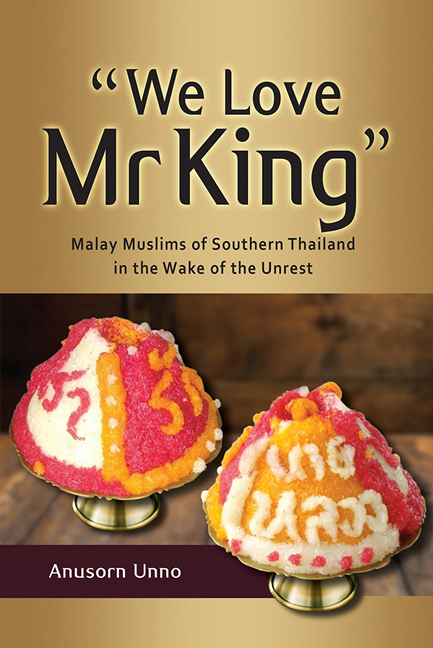 Book: "We Love Mr King"
During a hot, breezy afternoon in Guba — a Malay Muslim village in southern Thailand — a schoolchild halted and reoriented a routine conversation at a roadside pavilion by bringing in a decorated, footed tray. The tray had been made for the opening ceremony and parade for Tadika Samphan, an intramural sports game among members of Taman Didikan Kanak Kanak (Tadika) in Raman district of Yala Province. The tray contained tricoloured sticky rice that inscribed a sentence, “เรารักนายหลวง” (rao rak nay luang), purposely meant to mean “We love the king”. It would not have drawn much attention from those at the pavilion if the word for “king” had been spelled as it should have been. Instead of “ในหลวง” (nai luang), “the king” — the most commonly used phrase for designating the Thai monarch — what was inscribed instead was “นายหลวง” (nay luang), a term that literally means “Mister Luang” and that, for Thai-speaking people, has nothing to do with the Thai monarch. After my remarks on the title nay luang, the others at the pavilion had various reactions. Some were surprised and said they had never before realized that the nay spelling was incorrect, despite the virtual omnipresence of the phrase rao rak nai luang nationwide, especially after state-supported campaigns in 2006. Others — especially those who had been involved in making the decorated tray — seemed embarrassed, as they had been particularly attentive in making it, and it had already been displayed in the parade and at the official opening ceremony, where senior government officials had been present. “It should not have happened”, one of them said in disappointment. Still, although some wondered if the incorrectly spelled phrase nay luang could be considered blasphemous to the highly revered Thai monarch, most of them did not take the issue seriously, considering it a small mistake they could joke about among themselves. The misspelled rao rak nay luang would have simply passed as an illiteracy issue, a failure of formal education, or an unintended consequence of the state's propaganda had it not been written by a group of Malay Muslims from southern Thailand, in a period when Malay Muslims were attempting to negotiate their subjectivity in questions relating to the state, their ethnicity, and religion. Late one afternoon, the back of the house of the family I stayed with was converted into a place to perform a ritual in response to a misfortune that had befallen the family's horse. Seven offering trays were placed in the middle of the space, and they were surrounded by family members, relatives, and acquaintances; Jaafar, Guba's leading ritual specialist, acted as leader. After Jaafar finished the first part of the ritual, Aiman, the horse's owner and also known to be a ritual specialist, continued the ritual by touching each tray while chanting to give the offerings to revered spirits. The spirits include family ancestors, art masters, the village founder, the Prophet and a Raman sultan, each of whom represents an authority figure in each domain of importance to the residents, namely kinship, art or tradition, community, religion and polity, respectively. While the authority figures representing the first four domains are non-controversial, that representing polity vividly points to conflict and that side of the conflict residents associate themselves with — Raman rulers vis-à-vis Patani rulers. Aiman told me later that, unlike people on the east coast of Thailand's Deep South who associate themselves with the Patani Sultanate, Guba residents are tightly connected to the Raman Sultanate in various ways. Guba was founded as a place for training the war horses and elephants that Raman rulers used in their wars with Patani, and Guba's founder had been appointed by a Raman ruler. In addition, Raman rulers also adopted several Guba children, and many Guba residents worked in the palace. The bonds between the people of Guba and Raman's rulers are deep and cordial and still strongly felt to the present day. That Guba associated itself with Raman rather than rival Patani is crucial. Thailand's Deep South is often indiscriminately regarded as a region of the ancient kingdom of Patani, with Langkasuka1 as its predecessor. Other interior polities, especially Raman, were considered by Thai and Malay nationalist historiographies as “a unilateral Siamese initiative” in Siam's attempt to dissolve Patani into more manageable petty states. Separatists of past decades as well as present-day insurgents have invoked this historical construct to justify their means and goals. My roommate Najmudin is a fascinating individual. He is a native of Baunae Jeudong village, about 15 kilometres away from Guba. But given that his maternal grandmother and relatives live in Guba, he has travelled to the village since he was young. He spent his youth and early adulthood in Yala city with “unconventional” friends, many of them Thai Buddhists. Then, he worked as a driver for Shakib, the Arzeulee SAO chief executive who at the time was an antique dealer. However, for various reasons, he quit that job and began to work for other people, mostly as a driver. After two years of being a freelance driver, Najmudin settled into the house of the family I stayed with, mostly driving and doing other chores for the family. The day I began my field research in Guba, Saifuldin and other family members assigned me to stay on the second floor of the house. The floor has one room, which belongs to Aiman (the homeowner), and outside the room is an old bed with a shabby mattress and pillow covered by a torn mosquito net, where Najmudin spends the night. The empty space between Aiman's room and Najmudin's area was allocated for me to make a sleeping place with some old mats. It is largely from our before-sleeping talks that I gradually learned how fascinating Najmudin's life is. In addition to helping the family out with various matters, Najmudin does some work for one kratom cocktail producer/seller, getting paid in product. If there is no work in the family, he hangs out with his friends, most of them living on the fringes of the law, during the day and returns home late at night. His life is like a mystery, and many residents regard it as extraordinary. However, he is still committed to being a good Muslim. He regularly performs Friday noon prayers at the mosque, and he attempts to fast during Ramadan despite the pain this causes because of his kratom addiction. Meanwhile, he also considers himself a Malay. In addition to participating in various Malay cultural activities with Aiman, he wears a waistband with ta krud (tiny, rolled pieces of metal inscribed with magic spells), a local belief he considers not in conflict with Islam, because, he said, “I don't revere it”. This book is an ethnography of the Malay Muslims of Guba, a pseudonymous village in Thailand's Deep South, in the wake of the unrest that was primarily reinvigorated in 2004. It argues that the unrest is the effect of the way in which different forms of sovereignty converge around the residents of this region and the residents at the same time have cultivated themselves and obtained and enacted agency through the sovereigns. Rather than asking why the violence is increasing and who is behind it, like most scholarly works on the topic, it examines how different forms of sovereignty — ranging from the Thai state and the monarchy to Islamic religious movements, the insurgents and local strongmen impose subjectivities on the residents, how they have converged in so doing and what tensions have followed, and how the residents have dealt with these tensions and cultivated themselves and obtained and enacted agency through the sovereigns. The phrase 'We Love Mr King' or rao rak nay luang inscribed on the decorated, footed tray is one example of how the residents crafted themselves as royal subjects and enacted agency through the sovereign monarch. This book is about how the Malay Muslims of Guba, a village in Thailand's Deep South, live their lives in the wake of the ongoing insurgency that was reinvigorated in 2004. It argues that the unrest is the effect of the way in which different forms of sovereignty converge around the residents of this region. It also argues that the residents at the same time have cultivated themselves and obtained and enacted agency through the sovereigns. As such, rather than asking why the violence is increasing and who is behind it, like most scholarly works on the topic, I examine how different forms of sovereignty impose their subjectivities on the residents, how they have converged in so doing and what tensions have followed, and how people have dealt with these tensions and cultivated themselves and obtained and enacted agency through the sovereigns. The question of sovereignty in southern Thailand dates back for many centuries. Between the fourteenth and eighteenth centuries, the question revolved around the ambiguity of sovereignty over the region. On the one hand, the region was composed of Malay sultanates, whose sovereignty had to be realized. On the other hand, the region was regarded by successive Siamese kingdoms as vassal states whose sovereignty needed to be recognized as well. A suzerain-vassal relationship was attempted, in order to address the ambiguity, but to no avail, resulting in wars between the Malay sultanates and Siam that recurred over the course of centuries. The question of ambiguous sovereignty was put to an end when the sultanates were incorporated into Siam in a process that began in the late eighteenth century and was only completed at the turn of the twentieth century. Now, Siamese sovereignty was the only form of sovereignty to be realized over the clearly demarcated territory. However, singular sovereignty over the territory did not put the question to an end. Rather, it generated a new question and a new form of conflict — a question of sovereignty over subjectivity, which led to the emergence of separatist movements. That is to say, although Siam's nation-building project was first launched inclusively, it was later carried out exclusively, associating the nation with Thai ethnicity and Buddhism at the expense of other ethnicities and religions.